So what is it that Scotland is doing to stay ahead in a highly competitive world? While we know London as an AI hub and the world is talking about China as a new contender in Artificial Intelligence and data gathering, Scotland has been working in a stealth mode to transform itself into the European data hub and attract the brightest minds into the field of data analytics. 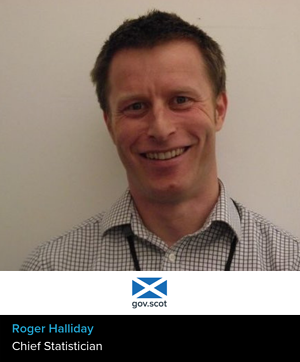 Roger Halliday joined Scottish government 6 years ago after a successful career with British NHS. Since then he has been working on the improvement of data gathering standards and bringing coherence to the data management domain, having recently combined the positions of Chief Statistician and Chief Data Officer of Scottish Government. As we know, data is a new oil, and those who possess the right data, have the keys to a better future. So what is it that Scotland is doing to stay ahead in a highly competitive world? How is it tackling the impending challenges of widespread automation and climate change? According to Mr. Halliday, the mission of his department is to improve people’s lives using data. Throughout Roger’s 6 years tenure with Scottish Government the staff of statisticians increased from 100 to 200 people. UK Government has allocated £1bln across the country to AI & data innovation. Local Research Councils devoted £5mln to data gathering in Scotland and over £300mln is being allocated to data analytics for the next 10 years. As we can see reining data is not cheap. While data gathering and management needs investment, the consequences of ill-informed government decisions are much more costly. Roger gave an example of a striking difference among seemingly similar communities having a drastically different level of development and crime. The goal of his department lies in equipping passionate local advocates with necessary data to implement turn around policies and claim money for the right initiatives. “You always need people who care, but they can be powerless if their arguments are not backed up by data. We are here for them”. Can data change the direction of government politics? According to Roger, this is what he observes all the time. Statistics department exists to measure the risk and cost of gathering data versus the public benefit it can bring. A powerful example would be the NHS implementation of preventative healthcare measures as a response to a little proportion of citizens consuming most of NHS resources. Machine learning and data analytics at its best! Society – what is happening at key stages of people’s lives and how government can best deliver to those starting studies, seeking employment or transitioning to new positions. Economy – tracking the progress of digitization and preparing new generations for increased automation. Environment – making sure Scotland is well equipped to withstand the immediate effects of global warming and can offer high quality of life to its citizens. “It all starts with children, - says Roger, - in line with the gathered data and employers’ needs we were able to appreciate the importance of data analytics and math in the coming decades. This allowed us to make those subjects an important part of school curriculum. Thus we are making sure future generation of Scottish citizens stay up-to-date in a rapidly changing world and Scottish employers have the right talent handy”. Apart from a data-infused school program, Scotland is also running an Executive Education workshop, which allows for the retaining of current workforce and an acquisition of more relevant digital skills. Talking about the environment piece of the puzzle, Mr. Halliday said Scottish Natural Capital almost did not change during the last 15 years. This means that while global average temperatures are increasing worldwide and the Planet is experiencing human-accelerated 6th mass extinction of species, Scottish natural reserves stayed pretty much untouched as the country entered XXI century. What is the secret? It turns out Scotland pays a very special attention to its biodiversity and quality of environment. A lot of work is being devoted to improve the biodiversity index and include more metrics into the calculations. Scotland is routinely measuring the flooding levels, air and water quality as well as the concentration of harmful elements in its atmosphere. “2/3 of Scottish electricity is coming from renewable sources”, - says Roger. It is logical to see Iceland deriving 85 % of its energy from Earth heat. Rainy and foggy Scotland, nevertheless, sets an ambition to become 100% renewable by 2020. If Roger’s department is as diligent in gathering data in 2020 as it is today, we would know how that ambition has been realized. With Five Scottish universities ranked in world 'top 200' and some of the most exciting discoveries of today being made in Scotland it is no wonder Scottish Government is closely collaborating with local academia to achieve its prosperity goals. Equally Roger and his team are cooperating with NYC and UNICEF for professional exchanges and knowledge transfer. When asked about what drives the data gathering in Scotland and who sets the agenda, Roger claimed that pretty much all political parties and citizens tend to collide on a Collective National plan which strives to achieve a number of positive outcomes concerning health, community and environment. Everyone being on the same page sounds like a utopia to me! Contemplating on what he would view as the greatest achievement of Scotland as a whole and his role in particular, Roger named reduced inequality and improved quality of life shared by all members of Scottish society, rather than a small elite. Sounds like a reasonable benchmark. After all, having the right data, we are well equipped to help those who need us most! Kate Levchuk, columnist, is a London-based futuristic blogger writing on transhumanism, AI and the philosophy of tech. Kate is passionate about an infinite human potential and the role of technology in uncovering this.